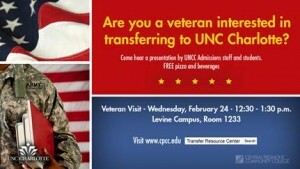 Are You a Veteran Interested in Transferring to UNC Charlotte? The TRC and the Center for Military Family and Veterans is excited to welcome a representative from UNCC’s Veteran Student Services department to speak to CPCC veteran students interested in transferring to UNCC. This event will be held at the Levine Campus on Wednesday, February 24 from 12:30-1:30 p.m.(LV 1233). This is a great opportunity for veteran students to gain insight and assistance in the transfer process to UNCC. Student Veteran Carlton Jones (in the Army hat) joins Student Veteran & SVA President Dan Bailey (in the sunglasses) at a past Veterans Day Flag Ceremony. 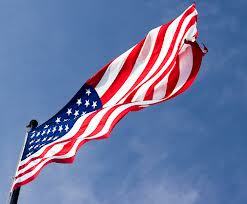 honors the veterans who have served and the ones who have made the ultimate sacrifice for this great nation. In preparation of this event, we are asking for volunteers to help with the flag placement for all the soldiers who have lost their lives since September 11, 2001 (approximately 7,000). Weather permitting, we will start November 4-November 9 from 9 a.m.-4 p.m.; if you are willing to volunteer, please meet us in front of Overcash anytime during those hours. Feel free to email Sylvia.bivins@cpcc.edu or call 704-330-3271 if you have any questions. To honor the country’s veterans, the CPCC City View Cosmetology Center is offering free haircuts to CPCC faculty and student veterans at its location (1609 Alleghany St.) from 8:30 a.m. – 1:30 p.m., Nov. 10 – 13. To qualify, individuals must have a valid CPCC ID and military ID. You are invited to attend a presentation given by UNC Charlotte admissions reps. They will talk with CPCC students about the transfer process to UNCC and answer questions. FREE pizza and drinks will be provided. CPCC Veteran students are invited to attend a transfer admission presentation given by UNCC Veterans Affairs and Admissions Representatives. 10 a.m. – 1 p.m. 1:30 – 4:30 p.m.
For more information about Transfer Tuesdays and other services offered by the Transfer Resource Center, please visit our website at www.cpcc.edu/ican/trc. In honor of Veterans Day on Nov. 11, the CPCC Cosmetic Arts and Science Club (CASA) will offer free haircuts to veterans. This offer is reserved for CPCC faculty and student veterans. Clients must have a valid CPCC ID and military ID. 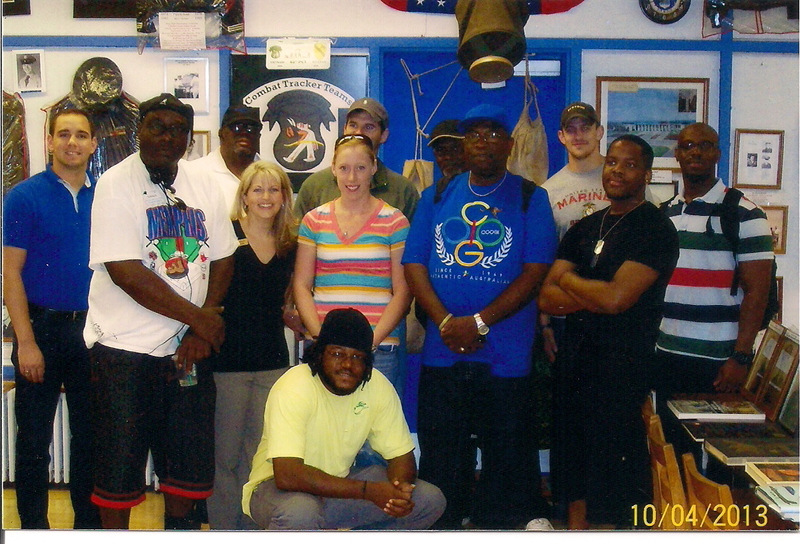 WHEN: November 11 – 14, 8:30 a.m. – 1:30 p.m.
On Friday, October 4, 2013, the Learning Community for Veterans at CPCC visited the Price of Freedom Museum, located in China Grove, N.C. The museum offered students a chance to view artifacts from 20th century American wars, engage in oral history and research, as well as encouraged students to share their own veteran story with the museum. Veteran student, Jesse Feury, sent a shout-out to the museum and the volunteers, “I really appreciate the commitment and dedication of all the citizens that volunteer at The Price of Freedom Museum, and for taking their personal time to inform our youth about the sacrifices that were made in name of Liberty!” The Learning Community for Veterans is collaboration between ENG 111 and HIS 132 and is held in both the fall and spring semesters at CPCC’s Central Campus location. For more information about the Price of Freedom Museum, please visit their website at http://www.priceoffreedom.us. 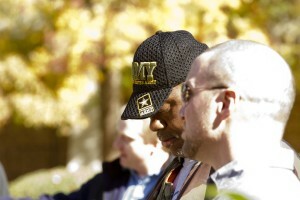 For more information about the Learning Community for Veterans, or other veteran related opportunities, please contact the Veterans’ Resource Center at CPCC http://www.cpcc.edu/vrc?searchterm=veterans+resource+center. Remember to register early for the best course selection! The information below provides priority dates and times for currently enrolled students and the first open registration date for new and returning students. If you are a currently enrolled student, you will also receive notification of your assigned priority registration date via your CPCC email account. Corporate and Continuing Education for summer classes begins April 26 and is ongoing throughout the term. For more information, call 704.330.4223. *For purposes of priority registration, completed credits do not include ungraded classes, audits, grades of “I” or “F,” literacy classes or non-credit continuing education classes. To view your priority registration date, go online to CPCC Login, log in, click on “Students” and then choose the “Priority Registration – View priority registration information” link. Monday, Nov. 12; 11 a.m. In observance of Veterans Day, CPCC’s SVA Chapter will host a flag raising ceremony at the flag pole on CPCC’s Central Campus. The event will also include, a salute to all of the military branches of service, a moment of silence for America’s fallen soldiers and the playing of “Taps.” The public is invited to attend this memorial event as well. If you have any questions, please feel free to contact Sandee Patton at ext. 6267. Newschannel 36’s Michelle Boudin recently reported about a single dad who is coming to CPCC for a new career. Thanks to the College’s Veterans Retraining Assistance Program (VRAP), he’s receiving financial assistance with his education. 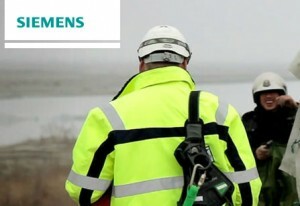 Siemens Energy Inc. is recruiting for paid apprenticeship positions in the area of maintenance / mechatronics for veterans with experience and training that aligns with this area of work. Apprentices will gain the knowledge and expertise to maintain, repair and start up highly complex manufacturing machinery. There are four positions available for an August start-date and the students will be simultaneously enrolled in a corresponding CPCC program while gaining training and work experience at Siemens. To be screened for the application process, contact Chelsey McRorie of the Veterans Resource Center (704-330-6229) immediately. CPCC and Charlotte Bridge Home (a non-profit organization established to assist veterans in Charlotte-Mecklenburg) are working together to assist veterans in obtaining meaningful employment and access to needed support services. CPCC's Veteran's Day Flag Ceremony. The Veterans’ Employment and Support Initiative seeks to address the near 11.5% unemployment rate among veterans. CPCC will provide veterans with career counseling and the training to equip them with the skills in demand by area employers. Charlotte Bridge Home will link veterans to services in the community and will work with employers to increase awareness of veterans’ employment needs. To make a gift to support this initiative visit https://shop.cpcc.edu/donation/giving.rios. Please fill in “Specify Department/Program” space on form with “VEI” for Veterans Employment Initiative. For additional information, please read the Charlotte Observer article about this initiative: http://www.charlotteobserver.com/2012/02/29/3056420/businesses-raising-1-million-to.html. challenges of transitioning to civilian life, adjusting to the role and responsibilities of being a student, coping with depression, anxiety, and/or PTSD, as well as other related personal concerns. The group will meet each Thursday from 9:30 to 11 a.m. for 10 consecutive weeks beginning on Thursday, March 1, 2012. Group participation is completely voluntary. If you believe that you would benefit by focusing on any of the areas listed above, or if you are interested in the opportunity to share personal concerns within a supportive group environment of veterans, please contact Christopher Lloyd at 704.330.2722 ext. 3454 or at Christopher.Lloyd@cpcc.edu or Wesley Phillips at 704.330.2722 ext. 3448 or at Wesley.phillips@cpcc.edu. The Veterans Resource Center is located on the second floor of the Terrell Building on CPCC’s Central Campus. The Financial Aid & Veterans Affairs Office would like to advertise the Barry M. Goldwater scholarship information for the 2012-2013 academic year. To honor former Senator Barry Goldwater, the Barry M. Goldwater Scholarship and Excellence in Education Foundation has created the Barry M. Goldwater Scholarship. The Barry M. Goldwater Scholarship was created through the operation of an education scholarship program and is financed by a permanent trust fund endowment. The scholarship is designed to encourage outstanding students to pursue careers in mathematics, the natural sciences and engineering. Must be an undergraduate sophomore- or junior-level student, at two- and four-year colleges and universities accredited by the Department of Education. Must be enrolled and matriculated in a degree program at an accredited U.S. college. Must be pursuing a bachelor’s degree as a full-time student during the forthcoming academic year. Must have a college GPA of at least a “B” average and be ranked in the upper fourth of his or her class. Must be a U.S. citizen, national or resident alien (resident aliens must include a letter of the nominee’s intent to become a U.S. citizen and a photocopy of the Alien Registration Card). Must have selected a field of study that will permit admission to a graduate or professional program in preparation for a career in mathematics, the natural sciences or engineering. The CPCC Barry M. Goldwater Scholarship application submission deadline is January 16, 2012. The Barry M. Goldwater Scholarship application may be submitted online along with additional supporting documentation at http://www.act.org/goldwater/apply/index.html.